Don't miss these great programs starting April 9! Don't miss these great class offerings! Wednesday, April 9, 2014 from 7:15 - 8:30 p.m. This holistic practice is based on an ancient Indian method of inducing complete physical, mental and emotional relaxation. Combining alert awareness with deepest relaxation, you will be empowered to tap into your own source of intuition, creativity, health and abundance. It is a journey of the movement of awareness from the physical body to the depths of consciousness allowing you to unfold your full potential. Researches also indicate that this technique can be used therapeutically to cure psychological disorders like anxiety, hostility, insomnia etc. and psychosomatic diseases like asthma, coronary heart disease, cancer, hypertension etc. The class will begin with 15 minutes of light yoga postures and subsequently the students will be invited to lie down in shavasana and will be guided through a complete visual imagery or a scan of the body and the contents of their emotions to create a sense of inner harmony and balance. The students will also be provided with a hand out of complete information about the meaning, significance and technique of this practice for a better understanding so that they can get the most out of their sessions at Kempo Fitness. Monday, April 14, 2014 at 10 a.m. This internationally recognized “Mommy and Me” early childhood music and movement program is based on the fact that all children are musical and love to move. Mommy’s and their children will have lots of fun together, while their children learn to sing in tune, keep beat and participate with confidence. This class helps provide your child with the basic musical skills needed to enjoy school and social musical activities, and later to study an instrument. This class is administered by the staff of Conservatory of Musical Arts. Saturday, April 12 from 10 a.m. - 1 p.m.
Saturday, May 17 from 10 a.m. - 1 p.m.
Every commercial has a “voice.” Who provides that voice; could it be yours? This 3-hour class gives adults an overview to voice-over as well as teaches you to express yourself effectively and communicate more clearly. Find out what voice-over work is all about and if it’s right for you. Each class will provide some hands-on experience performing a script on the microphone and plenty of time for questions. This course teaches students about both the acting and technical sides of the process. Through discussion, practical handouts and time at the microphone, students will begin to develop the tools necessary to be successful in the Voice-Over industry. Children must be strong readers. Wednesday, May 14 from 6:30 - 8 p.m. Participate in a fun and creative workshop which will help you envision, organize and prioritize your dreams and goals! We will create a vision board which consists of words and images of what you would like to manifest in your life. Please bring a pair of scissors and pictures, words or drawings to include on your board. Additional materials will be available. Wednesday, May 21 from 6:30 - 8 p.m. The "Attitude of Gratitude" has been linked to a greater appreciation for life, less anxiety and depression and better overall health. Come and learn how to cultivate those positive thoughts by learning a variety of different practices and exercises to awaken the gratefulness in you! **This is a two-part series. Registration is for both workshops. Click here for a complete listing of youth and adult classes taking place this spring. To register online, visit: https://RecOnline.CherryHill-NJ.com. All attendees will be entered into a raffle for a chance to win a $25 gift card to Kuzina by Sofia! ~Get Active ~Get Healthier ~Know your numbers! 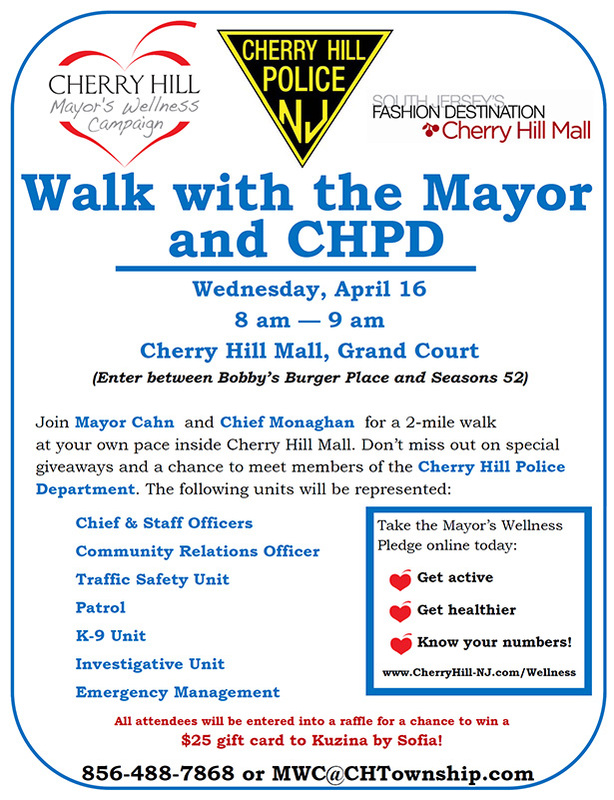 For more information: 856-488-7868 or MWC@CHTownship.com. For more information, please call 856-488-7868 or email Recreation@CHTownship.com. To register online, go to https://RecOnline.CherryHill-NJ.com.